Achieve a naturally beaming smile with Pearl Drops Pure Natural White, an advanced whitening toothpaste that utilises White Clay extract to inspire brighter, pearly whites. The brand's clinically proven lowest abrasion formula, the glossy toothpaste delivers a gradual whitening effect for a natural-looking smile. It contains charged Bentonite Clay particles which lifts away impurities and targets stains on the surface without damaging enamel. The lightweight toothpolish is formulated with 90% natural origin ingredients* and works to gently reveal a whiter-looking smile in two weeks. Essential Fluoride and Plaque Removers promote strong, healthy teeth with everyday brushing. 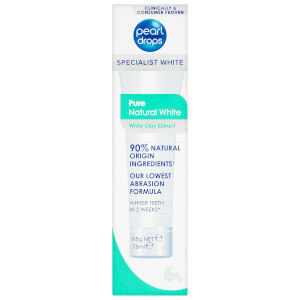 Use daily to achieve gradual, natural-looking whitening. Infused with Peppermint Oils to lend your mouth a refreshing lift. *mixture of natural and derived mineral origin ingredients. Hydrogenated Starch Hydrolysate, Aqua, Glycerin, Hydrated Silica, Alumina, Sodium Dodecylbenzenesulfonate, PEG-12, Aroma, Magnesium Aluminum Silicate, Pentasodium Triphosphate, Pentapotassium Triphosphate, Cellulose Gum, Sodium Fluoride, Sodium Saccharin, Pearl Powder, Limonene, CI 77891. Contains Sodium Monofluorophosphate (1360 ppm F).